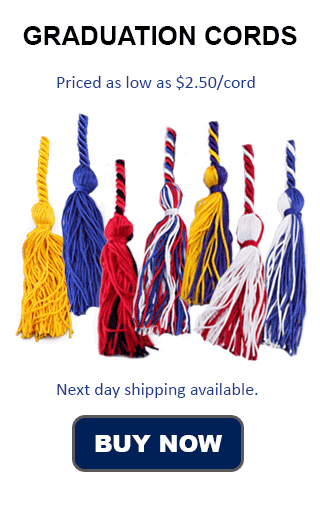 Alpha Beta Kappa Graduation Cords are red and blue, which are the colors of the honor society. At Honors Graduation we carry red and blue cords, they can be purchased as a "double cord," that is one royal blue graduation cord, and one red graduation cord being tied together with a simple overhand knot. This is a look that truly impresses on Commencement Day, and shows your membership in an exclusive honor society, Alpha Beta Kappa. Alpha Beta Kappa chapters are found in private proprietary schools and also non-profit postsecondary institutions across the country. Alpha Beta Kappa was founded in 1977 and helps students attain their potential. To qualify for membership one must be excellent in the the classroom, laboratory, shop and studio, have integrity, leadership and service. Also someone wanting to be a member would need to achieve marks of "A" or be in the top 10% of the class. Some accredited schools, colleges, universities, and institutions that Alpha Beta Kappa students are the ITT Technical Institute, Pioneer Pacific Colleges, Bristol University, Cleveland Institute of Electronics, Bryant & Stratton Colleges, Coleman University, Kaplan University, Irvine University, Ohio Business College, Hamilton Technical College, adn Aviation Institute of Maintenance. In addition to these there are over 500 schools with Alpha Beta Kappa charters. In addition to being able to wear a Alpha Beta Kappa Graduation Honor Cord at graduation and other special ceremonies, members of the honor society also get a gold key distinct to Alpha Beta Kappa. A member could also include his or her membership on resumes, and receive letters of reference upon request. Alpha Beta Kappa's motto is "Faciemus," which is latin for "We Shall Build."